Brad Cooper, an IT Engineer residing in Cary, North Carolina was framed for the murder of his wife, Nancy Cooper in 2008. The case has all the hallmark signs of a wrongful conviction – tunnel vision, confirmation bias, mishandled evidence, destroyed evidence, witness coercion, exclusion of exculpatory evidence and a failure to investigate alternate suspects. Further, the State abused their power in an unprecedented move by hiding behind national security to avoid proper Discovery rules. The judge went along with it. 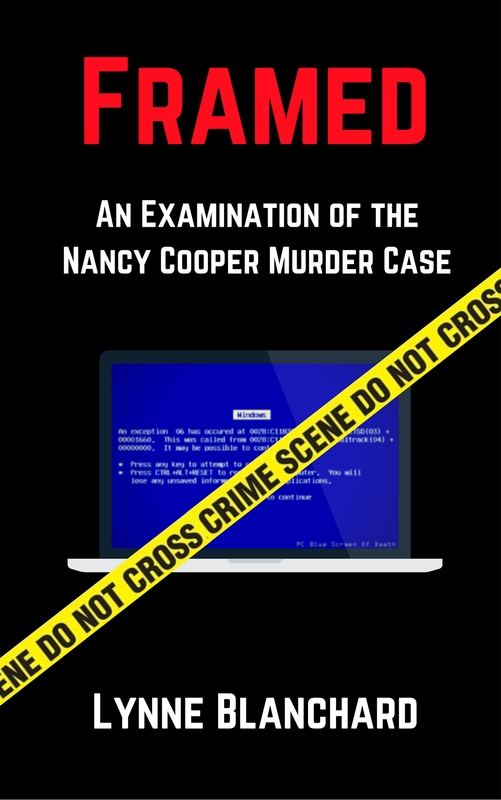 The only evidence linking Brad Cooper to Nancy’s death was Google map files found on his computer. The files appeared to be a search of the area where Nancy’s body was found and it would have taken place the day before she disappeared. There were multiple irrefutable signs of tampering found on the computer by Brad’s defense experts. A careful analysis revealed that the map files were planted on the machine. The jury would never hear the evidence and Brad was convicted of first degree murder. In September, 2013 Brad received relief when the North Carolina Court of Appeals overturned the conviction and ordered a new trial, but the justice system would continue to fail him. New counsel was appointed in January, 2014 when the NC Supreme Court denied the state’s PDR. Though this was a highly technical, complex case, Brad’s new attorney, James Freeman only visited him four times in nine months. A plea offer was presented to Brad in September, 2014. At that point in time, Freeman had not even finished reading the trial transcript, nor had he reviewed the discovery. He didn’t file a single motion on Brad’s behalf, not even for the computer discovery the Court of Appeals ruled he was entitled to. To top it off, Brad was going to have to face the same judge for the second trial. On September 22, 2014 a factually innocent man pleaded guilty to 2nd degree murder. Accepting the offer meant that Brad would have to serve just over six more years. If he chose to take his chances at another trial, it likely would have been at least a year away . . . two if he requested a new attorney to take on his case. With the terms of the plea deal, at that point he would have been looking at four more years until guaranteed freedom. It seems that taking the deal was the only logical choice under the circumstances. Why did they work so hard to ensure that Brad Cooper would take the fall for this? First, there was a lot of power and money in one corner. The Rentz family hired Tharrington-Smith to represent them. They worked fast to see to it that Brad would lose custody of his girls just two days after Nancy’s body was found. This law firm had their own investigators on the murder investigation. They gathered all of Nancy’s “friends” into their corner and a witch hunt ensued. Friends held affidavit preparation meetings and emailed each other examples of the types of things they should be writing to “assist” with the custody case. Brad lost his girls in a secret emergency custody order by Judge Sasser on July 16th, 2008. There was nothing to warrant this. By all accounts he was a wonderful father to Katie and Bella. Certain things were set in motion and it snowballed. The police chief, Patricia Bazemore made a statement that this was not a random act before Nancy was even found and before any investigation had begun. This is probably the quickest rush to judgement ever witnessed in a case. They ensured that this would have a certain outcome – Brad Cooper had to be proven to be responsible for her death. The public saw what was happening – he lost the kids and the police chief all but said he was responsible just days after Nancy’s disappearance. Brad’s fate was sealed which would ensure that the Rentz family would keep the girls and the police chief would save face for making those early, irresponsible comments that we now know were 100% baseless. When people inquired how they could assist with the investigation, Cary police asked them if they had spoken with Alice Stubbs of Tharrington Smith. State witnesses were told not to speak to defense investigators. Some slammed the door in the defense investigator’s face. When Tharrington – Smith deposed Brad Cooper in his fight to keep his girls, Cary police supplied them with questions. The firm worked hand in hand with law enforcement. At the custody proceeding in October, 2008, it was revealed that Cary police had shared certain discovery with the law firm that they had yet to share with the defense team. Police also supplied a witness with her phone records in preparation for her deposition with Brad’s attorneys. A chain of events occurred that would guarantee Brad would be held responsible for this crime. Cary Police had instant tunnel vision – ignored calls from 15 citizens who believed they had seen Nancy jogging that morning, did not speak to 4 year old Bella Cooper even though she had told Clea Morwick that she saw her mother that morning, did not even attempt to access Nancy’s cell phones to see who she may have communicated with in the days before her disappearance. Weeks later they would wipe all data from both of Nancy’s cell phones and state that it was an accident. There was no evidence linking Brad to Nancy’s death. Footprints and tire tracks near the body did not match Brad’s. There was no witness, no sign of struggle, no physical evidence whatsoever to support the state’s theory. Nothing. The state presented weeks of character assassination – “Brad was an absent husband” “Brad was an introvert.” “Brad had an affair” “Financial control” – None of it held any water. The public saw that. How was he ever convicted? A Google map search of Fielding Drive was found on his computer. The alleged search would have occurred a day before Nancy disappeared. Computer was not hashed until the FBI took it into custody in August, 6 weeks after it was seized. It was useless at that time. Prosecutors presented Gessner with an FBI affidavit blocking the defense from receiving discovery related to the computer evidence, he accepted it. Defense experts found several clear signs that the map files were planted on Cooper’s computer and a report was shared with the state. State experts did little to investigate the allegations of tampering and their one anonymous report later determined to be Chris Chappell’s of Durham police was incorrect on many counts. NC Court of appeals overturned the conviction because Brad’s experts were qualified to testify and should have been permitted to testify. This is not over. I recently published a book about the case – Framed. The book details all of the misconduct that occurred in the case. I had the opportunity to interview Brad Cooper and the book contains many facts that were never shared with the public. There will continue to be efforts to clear Brad’s name. It is so important for people to know the truth about this case. A guilty plea does not bar him from an opportunity to be exonerated. It is just a different route because he simply could not trust the standard path. Please contact me if you had any role in the railroading of Brad Cooper and wish to clear your conscience, or if you have any information that could potentially lead to the arrest of the real killer(s). I am currently doing paralegal work researching cases for The Deskovic Foundation for Justice. I also spent a great deal of time working on the Jason Young case — another very questionable case in Wake County, North Carolina. Jason was wrongly convicted of murder in 2012 and his case is still in the appeal process. If you wish to learn more about the case, please read my book, Absence of Evidence, which includes a great deal of information that was not revealed at trial. I have been personally involved with “false accusations” which involved someone very dear and close to me. And it also involved the Cary Police Department. I also find it quite interesting that although the magistrate found that the accusations did not warrant charges….that charges were eventually made….with even more charges to follow….and these charges were very serious charges….and a lawyer was willing to try to “get a plea deal” for someone who WAS NOT GUILTY….of the crimes the person was being charged with….this person was told by the attorney “that this is as good as it is going to get”…. REALLY? So is this truly how our North Carolina Judicial System works? No doubt someone was trying to just get a plea deal accepted and a case closed without the person being allowed a trial….perhaps this is the way it works, if a person is truly guilty and there is actual REAL EVIDENCE to convict a person of a crime. But when there are people who actually work in the system and know that there is “nothing” there….why do these people “waste the taxpayers’ time and money” for something that does not exist to begin with? Do the prosecutors just have to “met a quota of convictions to keep their jobs regardless of how this is done,setting aside all “fair and just” standards of how the Judicial System is suppose to work? That it DOES NOT MATTER to THEM whether or not a person is actually guilty of the crime. Have we gotten to this point in our “fair and just system” where nothing matters anymore? That all principles are set aside as long as a guilty conviction is the result and the case is closed?….as I overheard a ADA state in court last summer, “if (person’s name omitted) does not accept a plea, then I will get (person’s name omitted)on a felony. And the ADA proceeded to try to do just this without any just cause whatsoever. SOUNDS LIKE TO ME THAT WE HAVE ALLOWED our North Carolina Judicial System to become a “political arena” at any and all costs. Great blog!!! I too watched the entire trial, and, for me, it comes down to this: In a life w/out parole murder trial, it is inconceivable to me that a judge would not allow an expert witness (to refute the ONLY evidence against Cooper) because “the state was not given enough notice.” When that happened, it solidified, completely, the fact that the judge was willing to allow the state to get away with anything, while the defense would get peanuts (if that). If this verdict is not overthrown on appeal, my faith in the legal system in America will be officially destroyed. Thank you, Matt. I 100% agree with you about the judge. This whole thing was awful, everything about it. I wish someone could step in and fix it now. “Police refuse to investigate”, all too many local police are allowed to bring charges against someone or deny an investigation into cause of death upon their personal opinions or involvement in the case. When that happens, too often the medical examiner or coroner will follow their opinion rather than investigate the case. You might try to seek the help of the state “disciplinary counsel”. In their own way they will try not damage the verdict. The disciplinary counsel may dismiss what you say and state that you simply do not like the judge’s verdict. However they may be so vigorous and confident in their defense of the court’s wrongdoing that they falsify in the defense of the court. You then go after the disciplinary counsel with the state bar. It may not give you justice, but it does rock the boat.